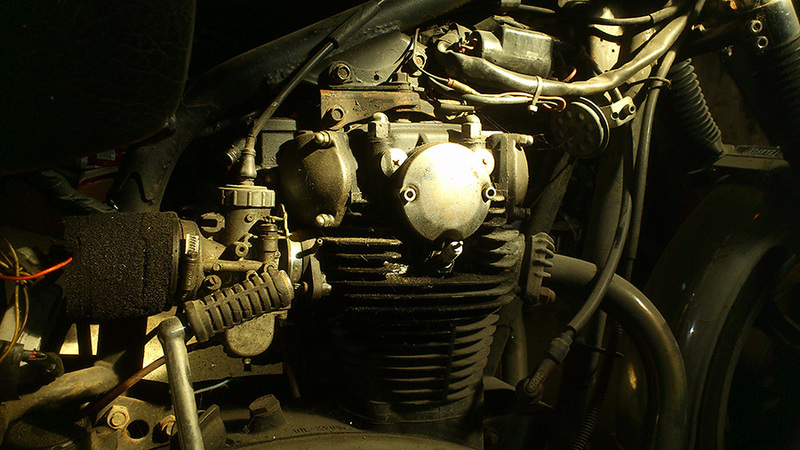 Discussion in 'The Garage' started by Grimly, Jul 10, 2014. Purple. I mean, purple. What on earth possessed the PO to paint it that colour? It's not even as if it's candy metalflake purple with iridescent flares or something; it's a plain bare flat purple. The same kind of purple your big toe goes when you drop a weight on it and your toenail is about to fall off. So, get it running again, fix the leaks, throw a tin of black paint on it and good to go. The brakes are in bits, but all the bits are there, new hoses, etc. Some of the chrome is a bit tatty - rear fender, as usual with these. On the good side, the rubber is good, the tank is sound and the cycle parts at one time were very well maintained and improved, until the PO. I don't think he really gave much of a stuff about it. 48K miles - not really a huge amount for one of those if looked after properly. I'm keeping my fingers crossed it has been. Just pushing it around today, I was immediately struck by how light it felt compared to the GS850 - really chuckable and that's with the yeehaa bars on it. I would think a set of Euro bars would complement it nicely. It looks more blue-ish there, but I can assure you, it's purple in reality. Mikuni carbs, which I discovered were a worthwhile replacement for the stock carbs, but not sure which model these are. These ones are not L and R handed - they're both L-hand ones. I suspect they may be off something else. The side is stamped 'H9 B1' on the left one - I presume the R one is the same. And, buried behind a panel is a Scottoiler. This one turned out nicely - none of that purple nonsense in it. 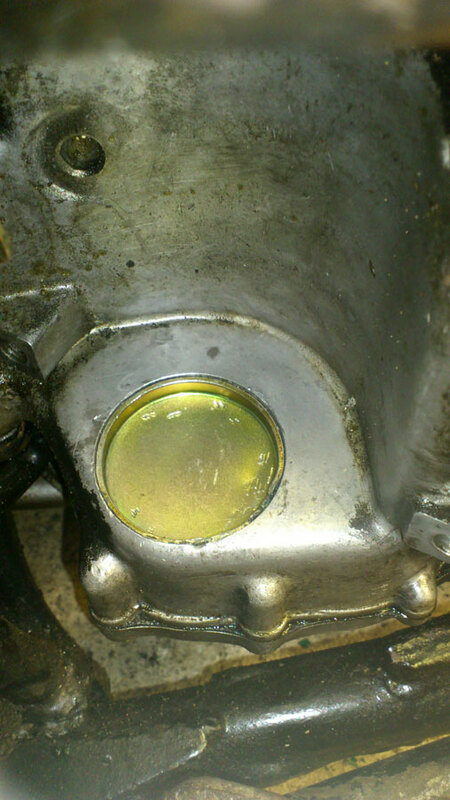 First up - attend to the oily bits and have a look at the filters and where the oil leaks are. When I dropped the remaining oil, there wasn't much debris adhering to the front drain plug, but a few flakes on the rear one, one of which looked like the result of a botched gearchange some time whenever. The main sump strainer needs replaced as there's a tear in it (but not a huge one) and I doubt if soldering it would work - but I'll give it a go. Virtually no debris was found on that strainer and since the front magnetic plug pokes up into the middle of that one, I'm inclined to take an optimistic outlook there. It was a different story with the side strainer, though. Plenty of debris at first glance, but not knowing the history, how far back does this debris go? I had mention from the PO that it leaked so much he never actually changed the oil, just kept topping it up, so this debris is likely accumulated from many thousands of miles. 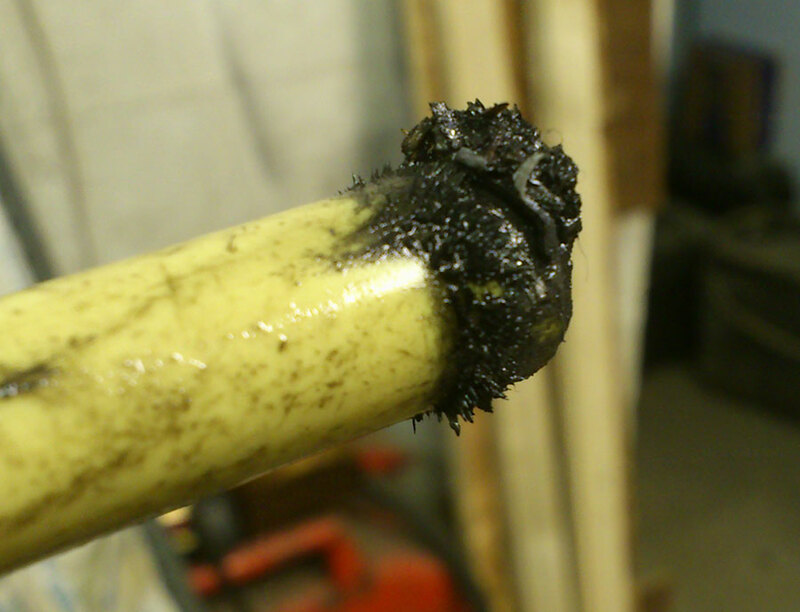 And here's the accumulated steel debris on the end of a magnetic rod. The oil leaks are several - there are one or two from the top end, but not that serious and I won't know exactly what or where until it's running. 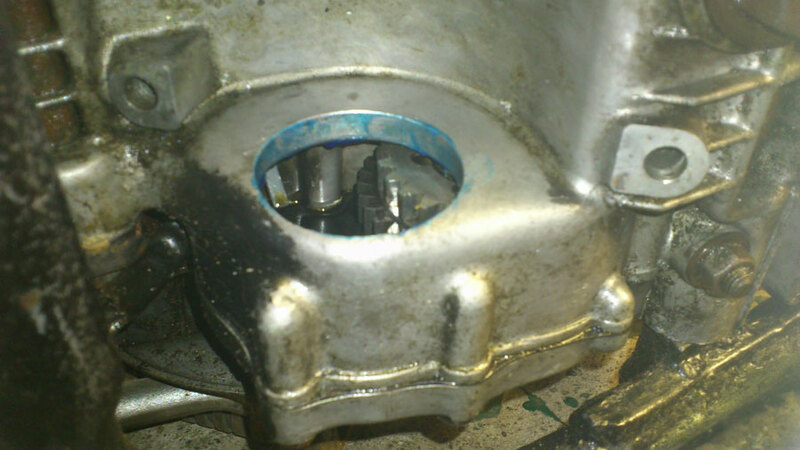 Bottom leaks are likely from the gasket around the main strainer/sump (two stripped 6mm bolts) and the O-ring around the starter. Also, the clutch casing gasket and there's another ribbed casing at the back of that, forward of the drive chain sprocket - those are oily at their bottom edges. 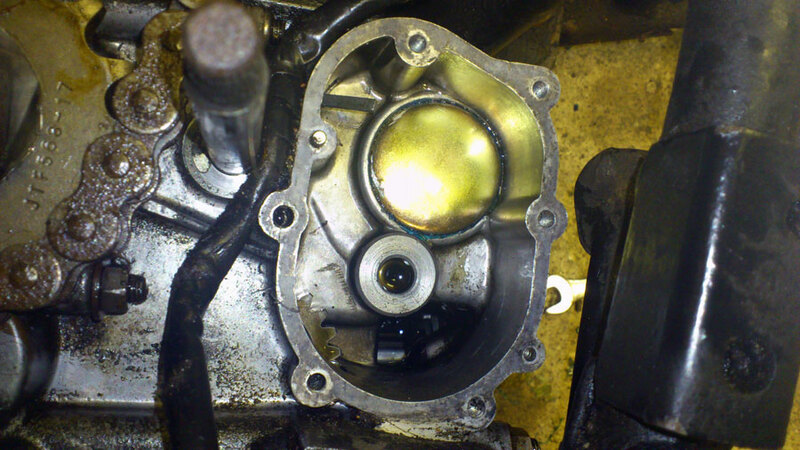 I might be lucky to get away with just replacing a couple of gaskets, an O-ring, a couple of helicoils and maybe a couple of valve-access gaskets up top. The stripped threads hack me off mightily - I can't stand gorillas who do that. why purple? Perhaps the painter was sick of black and around your way orange and green are political statements so those were out or perhaps the purple paint was a bargain? Spill some fuel on it and see if it washes off? BTW, what that bike could really use is a 10 minute session with a pressure washer. Welcome. 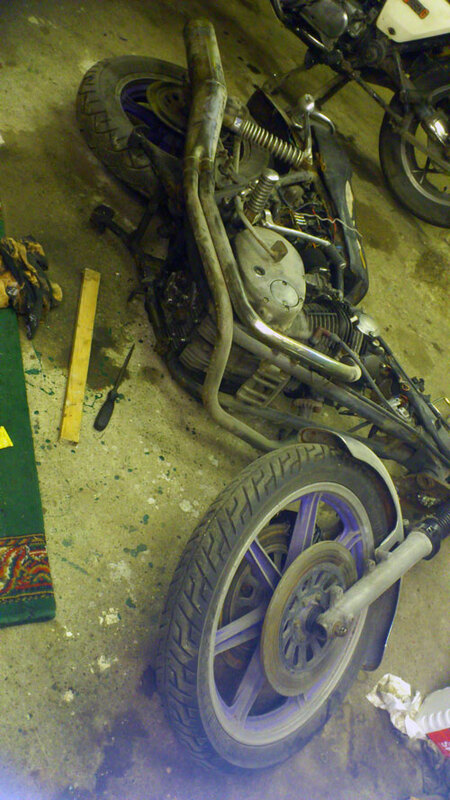 The bike needs a top end rebuild. The cam chain and front guide replaced. The good news is once the repairs are done it's good for another 48 miles. The bike has a lot of potential it just needs to be unleashed. The last few days have seen some poking and prodding when I got the chance, to find where the hideous oil leak was coming from. During its time in the kitchen, it was a steady dripper until two years go, then suddenly stopped. However, when I went to move it into the workshop it had got all excited and widdled all over the floor, just like a nervous munchkin. I honestly didn't think it had any oil left in it. Anyway, a degree of learning and slightly more familiarity led me to the starter - you all know what I found there. Seals shot and O-rings gone, of course. What a half-arsed design, that is. 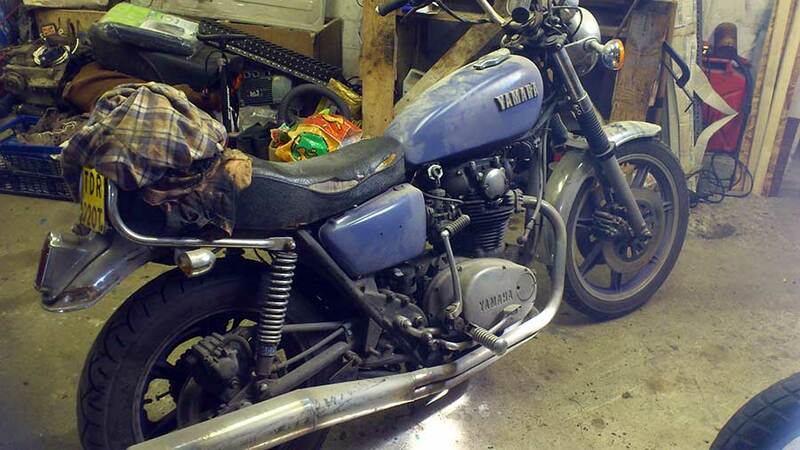 At any rate, I know it's a great and easy kick-starter, so I've got no qualms about heaving the starter motor onto the bench and leaving it there for a year or two for a Dave-time rebuild and I can get on with just tidying up and riding the thing eventually. The mention on these forums of hte Dorman 555-083 core plug had me intrigued, and how cheap they were too... not so here - I'd be cheaper to buy a box of ten from the US and pay shipping than to buy a couple and pay shipping from the UK. Some of the American car parts suppliers here are just robbing bastards. Howver, I found a Euro-size core plug at 46.5mm, which will grind down fine, with plenty of meat on it still. And so, at last for the first time in ten years, the auld sod might actually not leak; at least, not from that bit. 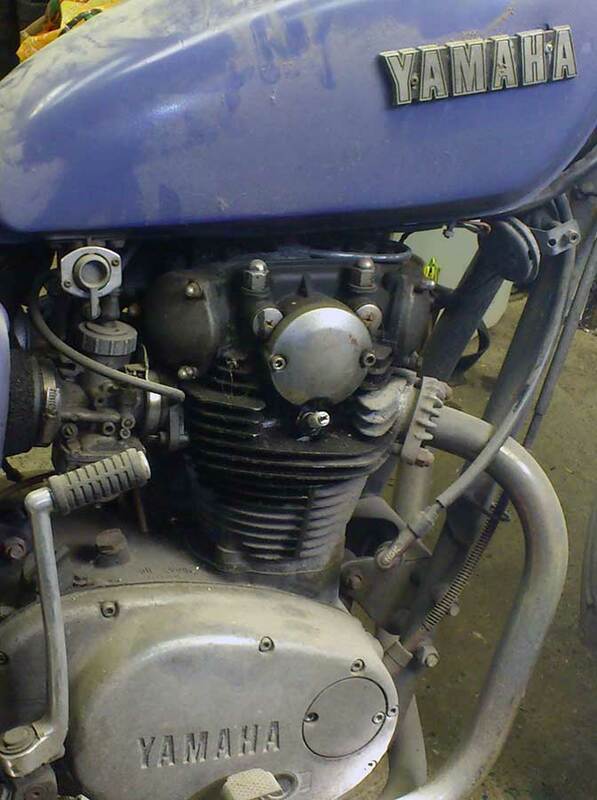 Mucked around with the front calipers on the XS650 - totally stock; was pleased to find one had been rebuilt not long ago (in mileage terms) and was fine, but the other one is a seized bear, missing boot, so need a kit for it. Cheap enough. There seems to be the same opinion about the OEM brakes on the late early80s XS 650 bikes as I have of the same era GS brakes - they work fine when in good order. Of course, there is the option to fit later Brembos, same as the GS. I'll get these ones fettled up and fit the new lines (one SS line came adrift from its termination - lucky that didn't happen on the road, a bad comment on the maker of that) that I bought shortly after buying the bike - heyhey, only 9 years later. 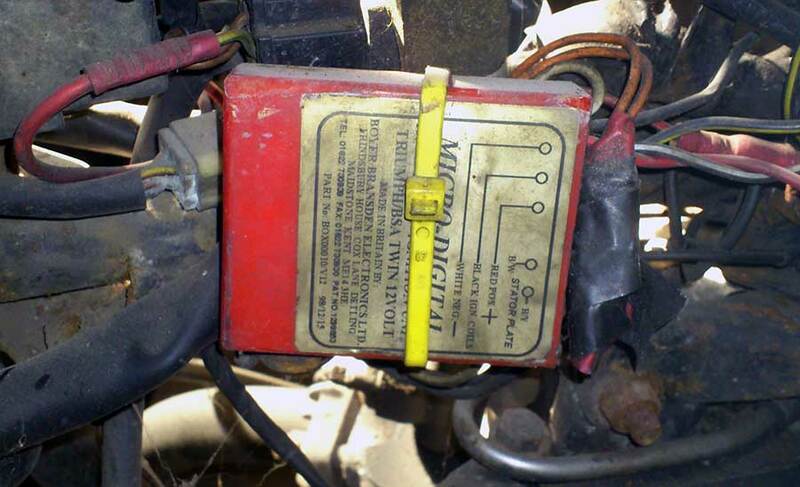 Aftermarket replacements are readily available and while they claim they're better and reinforced, they blow out too. In fact, the overall quality of the whole filter isn't as good as an original, so I prefer using patched old originals. The filter on the lower left above is a new replacement. As you can see, it tore, and on top of that, the magnet fell out too, lol. As you can also see from the above pic, the filters always blow in the same area, that part that juts out. The aftermarket version does have perforated sheet metal behind the screening (the claimed "improvement") but not in the area that blows out. Pretty stupid "improvement", reinforcing the areas that don't need it and not the section that does, lol. I'll be getting some Abro Steel today for the repair. I had some epoxy putty, but no information how temp-resistant it is, so the AbroSteel will do the job. I also acquired a spare sump plate to do a spin-on conversion on for later. I fixed the sump screen with epoxy putty a couple of days ago and put the plate back on, but still have to plug-tap an end hole to 1/4 UNC. One of the stripped holes came good with a longer bolt, but one didn't. 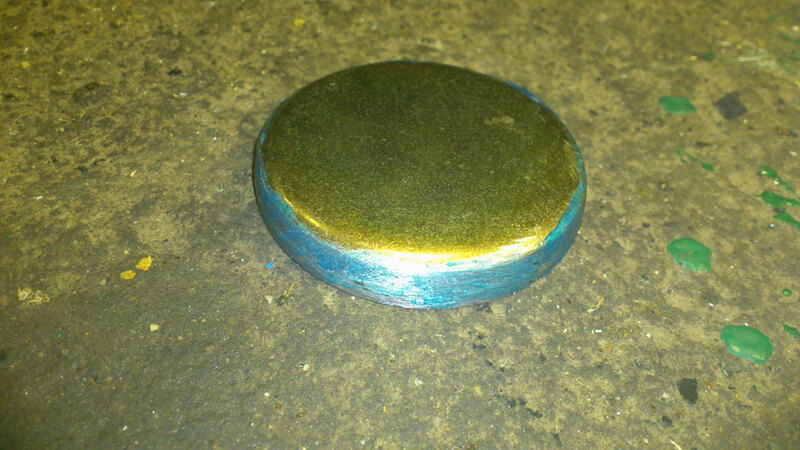 Today I ground a 46.5mm core plug to a bash-fit, smeared it with Hylomar and fitted it in the starter hole. 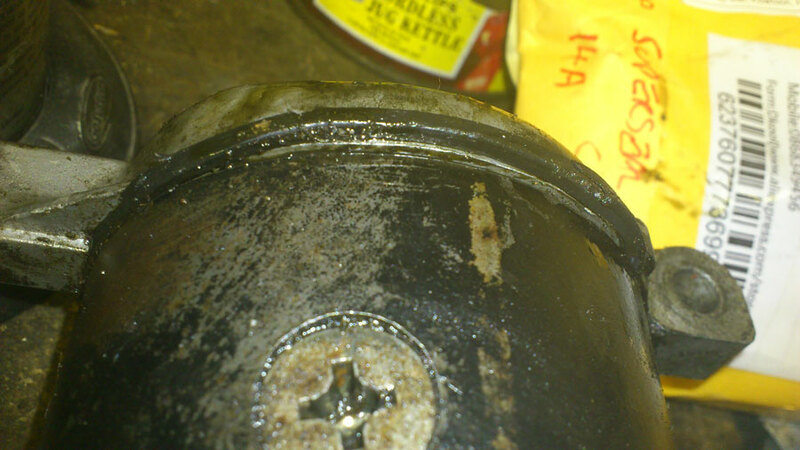 The PO had been busy, leaving large gobs of bathroom silicone hanging off the nose of the starter around the old seal. Some people shouldn't be allowed to use or even be near tools. Oh yeah, two of the starter bolts were missing. Bonus of the day: discovered a brand-new (well, was b-n 10 years ago, but unused since) reg-rec hiding up behind the foam filters, as the PO couldn't be arsed fitting it where it should go. I keep my fingers crossed it actually works. The way the brushes were wired changed in 1980. The combined reg/rec was also added but designed to work with the new brush configuration. If you run the unit with the older alternator, it will over-charge and fry something. Now, I'm referring to the stock combined reg/rec. There are aftermarket combo reg/recs that are designed to work with the older alternator and brush set-up. You will have to figure out if that's what you have. Right, cheers 5twins - I identified it as the Yambits one, though what its exact origins are, I don't know. If the slip rings and rotor are ok, I'll carry on with that for a while, but will look seriously at a PMA conversion and use a series reg/rec as I'd done on the GS - no more stator trouble. My word, it's so much easier to throw this Yam around and the advantage of it being an old snotter is I can simply tip it onto the floor to get at the awkward bits and know I can lift it easily. 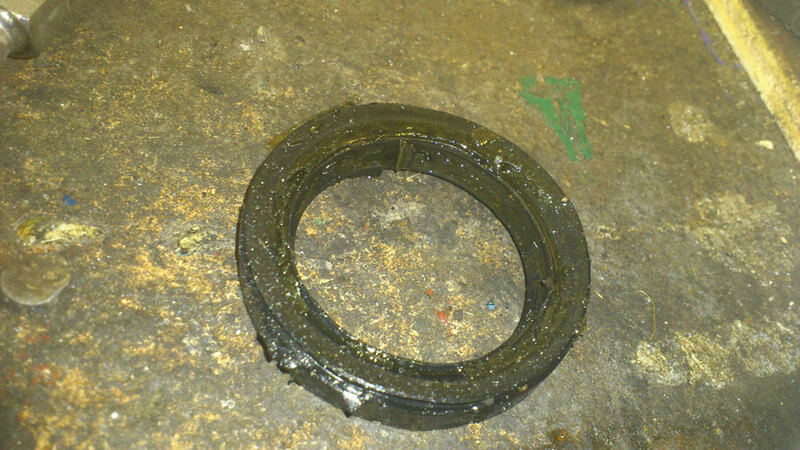 This was to remove the starter, which was leaking like a very leaky thing. PO's bodges included bathroom sealant around the nose of the starter (don't ask, it's a rubbish design), copper wire in place of split pins, loose front sprocket (I mean nearly coming off, type of loose). The starter O-rings were both like this, just hanging out. 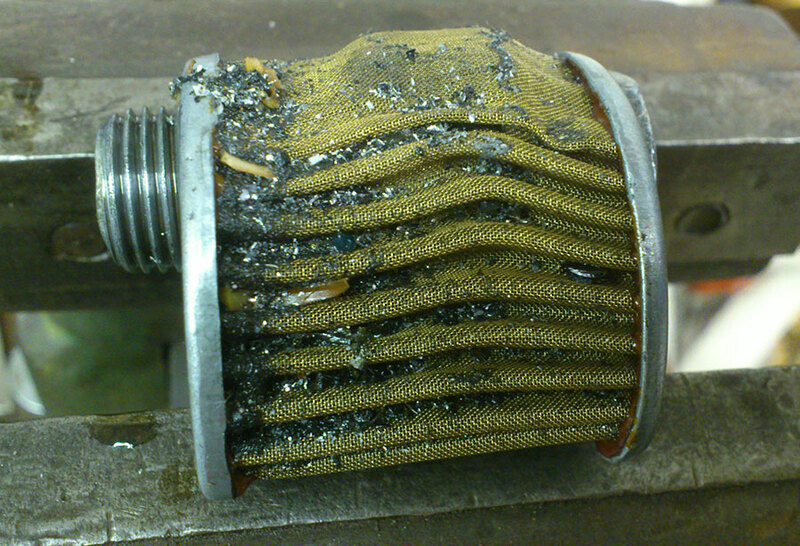 Checked the alternator brushes while I was in there - both fine, with 5mm and 4mm respectively until the wear limits. Assuming the alt still works, I'll lay in some replacements. it's been my experience that an XS650 sprocket nut comes off in two ways, one is loose enough to spin off by hand and t'other takes a 36mm socket and an air-impact wrench. 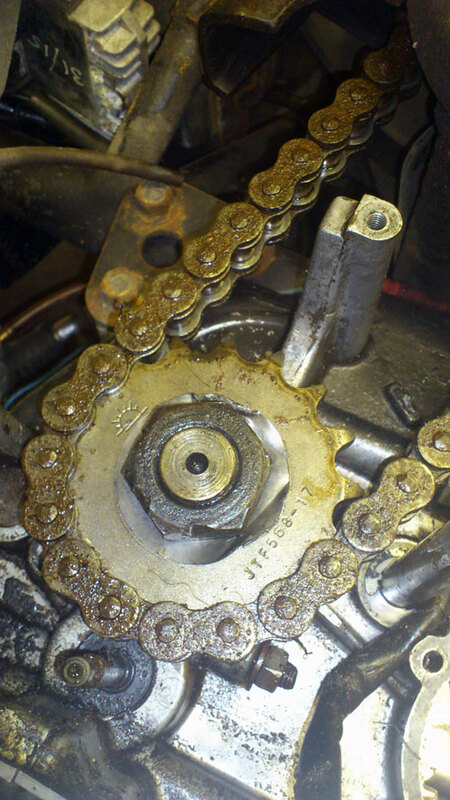 BTW, the sprocket photos showing the drive chain say that the bog-pan sealant wasn't working. There's a fairly new chain/sprocket set on it and the PO (or whoever fitted it) hadn't the proper tools - chisel gouges on the nut - and it had loosened off. It was actually spinning loose and only the slight bend on the washer had stopped it coming off. I find it amazing that someone could have left it like that. If they had a chisel they could have at least used it to bend the washer up properly. Close inspection of the sprocket area seems to show the oil seal there is ok, all the oil around there is coming from fling-off from the Scottoiler.